The beginner’s step-by-step guide from expert web developer. I am Sandesh Jangam. I am an expert web developer. I wrote this FREE guide to help Non-Technical Users. You can build your own website without writing a single line of code. I will show you how to create and grow your online presence. 4 Quick steps of this guide. First, understand what type of site you need. There are many different types of website. A website can be a personal website, a commercial website for a company, a government website or a non-profit organization website. 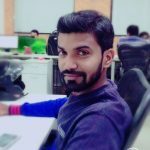 I will give you some idea about website types. Check this Ready Sites. Blog or Website with Blog – A blog is a type of website where the content is presented in a reverse chronological order (newer content appear first). Blog content are often referred to as entries or “blog posts”. Portfolio Site – A portfolio site is like your CV. The place, where you can showcase your work and give people options for contacting you. You can easily add a portfolio to your site with stunning image galleries, and beautiful sliders. Informational Site – A major informational site is wikipedia.org, the online encyclopedia. Now your small business may not want such a comprehensive site, but if you have information to share or sell, an informational website would fill the bill. Online Business Brochure/Catalog Site – Now we can cast a large net, reaching literally millions of people all over the world with just one website. With your online brochure or catalog, you can show anyone who looks for and finds your website, photos and descriptions of your products or services. There are many businesses that deal in products or services that are not sellable over the web—think hair-stylist, dentist, or day-care center. E-Commerce Site – Amazon is a best examples of E-Commerce sites. You can buy Electronics, Apparel, Computers, Books, DVDs & more. But you don’t have to be an Amazon to sell your products online. There are millions of small businesses who use their e-commerce websites to sell their products over the Internet. Well, You can build all of the above website using a single platform WordPress. If you are beginner then don’t worry about this too much. I will recommend you to start with Website with a Blog. We are going to use WordPress platform throughout this guide. WordPress is a most popular CMS ( Content Management System ) in the world. You can build any kind of website with WordPress, be it one-page website, a website with a blog, and even an e-commerce website. In order to create a new website with recommended WordPress platform, you will need a Domain Name and Web Hosting Provider. The WordPress platform is a opensource and FREE platform. However, the domain name and web hosting will cost you around $3.95 – $5.95 a month which is less than monthly mobile recharge in India, so It will not cost you too much. Owning your own domain name looks far more professional and it helps you stand out from the crowd. The important thing is you will get it FREE. Later in this guide, I will tell you how get a FREE domain for yourself. Having your own hosting will also ensure that your website loads quickly and won’t go down for hours at a time. It is very important for anyone who visits your pages! How do I get FREE domain name and web hosting? 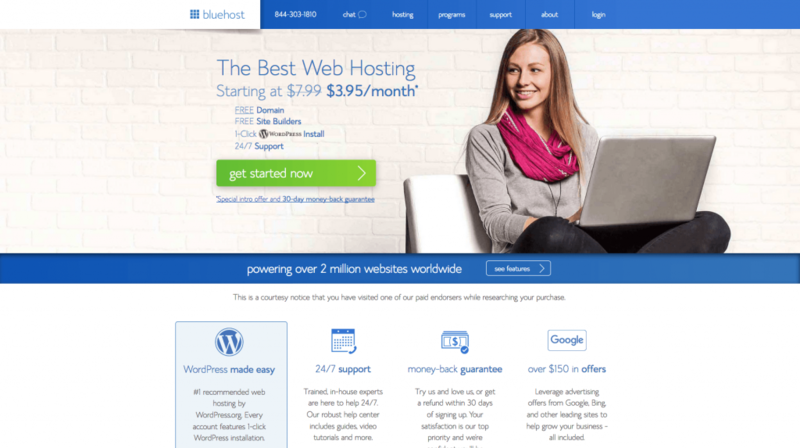 I highly recommend Bluehost Hosting, which powers over 2 million websites worldwide. They’re really affordable, have a good customer service, and currently they are giving away a domain name for FREE. When you get a domain name, you will also get personal email account(s) like you@yoursitename.com. It is far more professional than generic Gmail or Yahoo address. 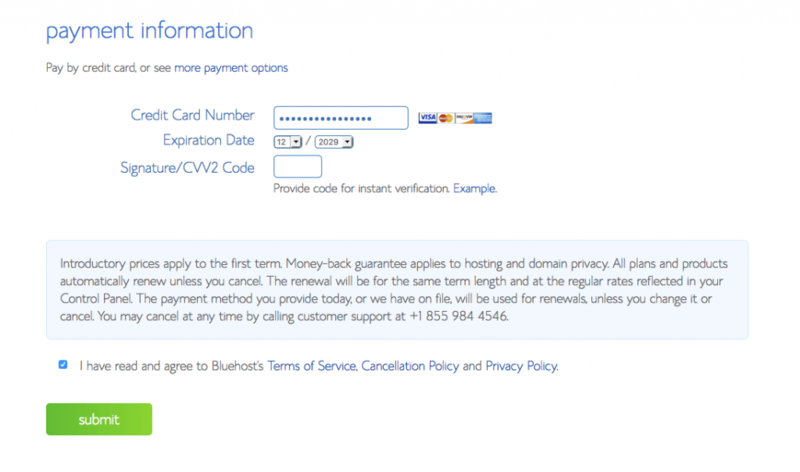 To begin, go to Bluehost Homepage and click on “get started now”. 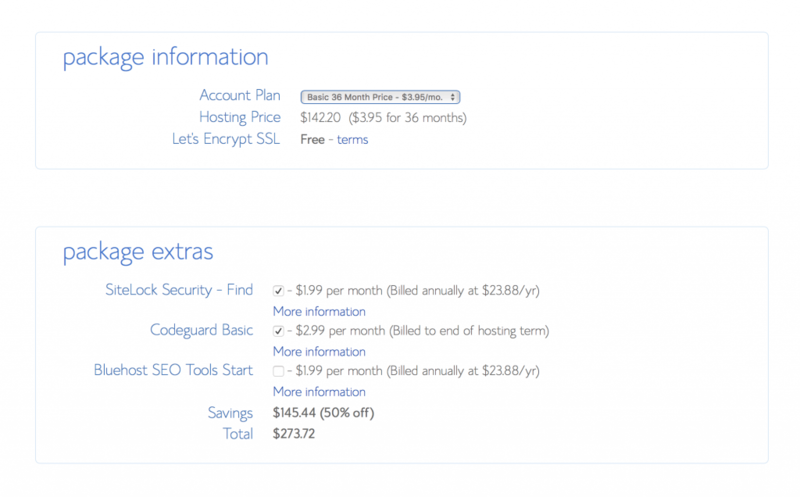 Now, you are already on hosting plan page. You need to select any one of the plan. If you are beginner then go for basic plan. Basic plan is great choice and it will save your money too. Well, as I promised you will get free domain too. Just enter you you domain name under “new domain”. It absolutely free. Avoid the weird extensions and go with .com, .net or .org unless they perfectly describe what you have to offer – and even then, see if you can find a more common name. Now, you need to fill your personal details to create your account. 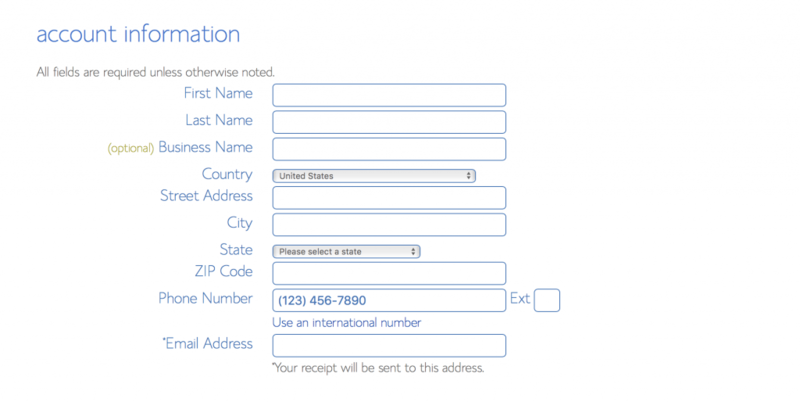 Your receipt will be sent to the email address you enter here. The next step is to select your plan and package. Select any plan which is affordable for you. Just unchecked all the all the check boxes from package extras if you don’t need this features. After making payment, you will see another sales page. Ignore this and Click on “no thanks” at the end of the page. On the next page, you will see a confirmation of your purchase, and you will see a screen like the one below. Click on “create your password”. Now it’s time to get your website up and running. Well, WordPress is already installed on your site. 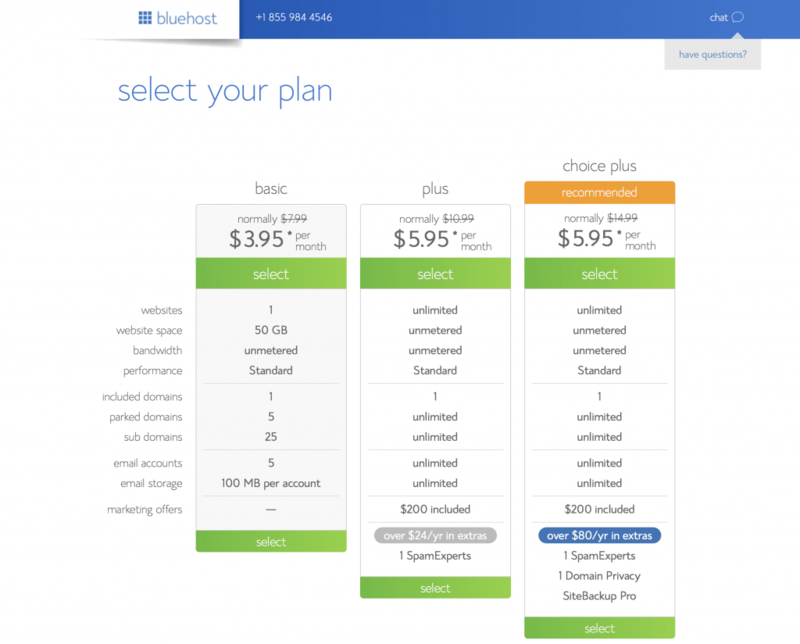 Bluehost done it for you to get you started easily. Now, Log in to your WordPress dashboard to complete further step. 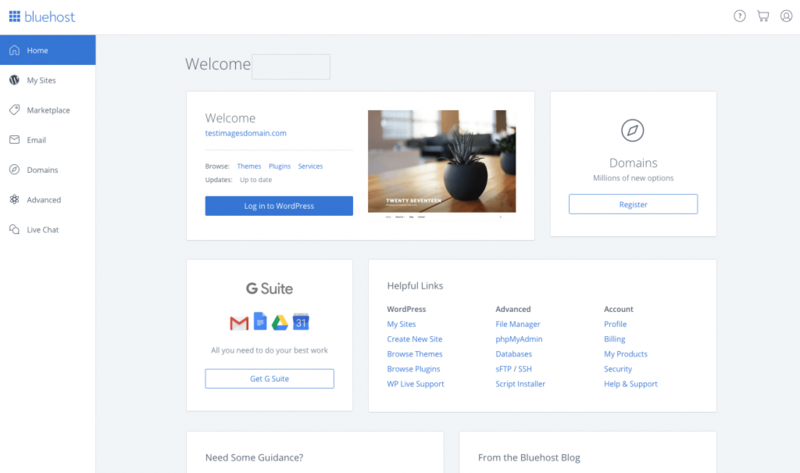 To login in your WordPress, click on Login to WordPress from bluehost cPanel or type https://yoursite.com/wp-admin (replace “yoursite” with your domain) in your browser. Enter your username, password and you are in. After installing WordPress, you will see default WordPress theme which is built-in with platform. We are not going to use that theme. The default theme has a very basic look. Check this ready sites that we are going to use. Amazing sites right? Once you login to your WordPress dashboard, you have just got access to your WordPress platform. In the left sidebar you will see “Appearance” menu. Just take your cursor over it and then click on “Themes”. It will open up themes screen. Click on “Add New” button beside top search box. Just search for “Astra” theme in the search box. It will show you the result. Take your cursor over Astra theme and click on “Install”. After installation, click on “Activate”. Yeah, Now your theme setup is ready. Now, we are going to install plugin that will automatically import any of the site from this ready sites. Now, Just take your cursor over “Plugins” menu and then click on “Add New”. It will open up plugin installation screen. Just search for “Astra Starter Sites” in the search box. It will show you the result. Click on “Install Now”. After installation, click on “Activate”. Great, Now your WordPress platform basic setup is ready. Well, Now you have all necessary setup ready to design your website. I will tell you how to design your whole website with just 1-click import like magic. I will show you how to do it. - Go to "Appearance -> Astra Sites"
In this tab you will find all the ready sites. Click on a Elementor page builder and Select Free category. Now you will see all available free sites. Select the site you wish to use. Please note that agency label sites are available only for Astra Agency users. Select any site which you want to use for your website from FREE category. Click on is and proceed for next step. Once you click on a site you wish to import then it will preview the site. It will ask you to install required plugins. Just click on Install Plugins button which is at bottom left corner. It will automatically install all required plugins for site. Now after successful plugin installation button will turn to Import This Site. Well done..! You are now just few steps away from your ready site. Just click on Import This Site button. 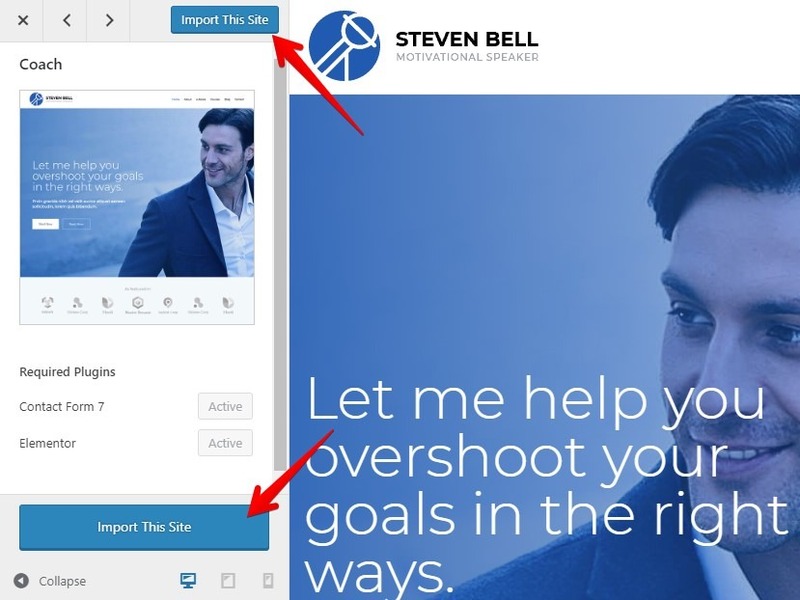 Wait for few minutes and your site will import with all pages, post, images and demo content. After few minutes… Cheers. You site is imported successfully. Now we just need some changes to complete the site. If you’ve followed the steps in this guide, you should now have a fully-functional WordPress website! The next step is, you need to change logo site title and other endless tweaks. Well, Site Title is your site name and simple one line that describe your site is a Tagline. 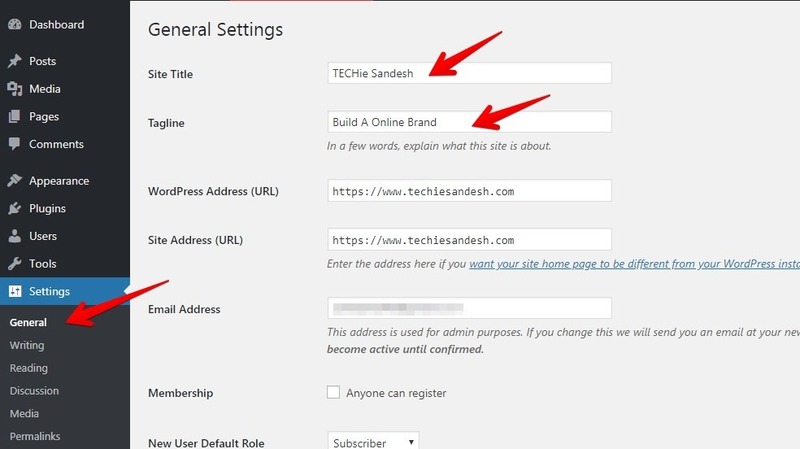 For example, my site’s title is “Techie Sandesh”. In order to change the title and tagline on your website, go to “Settings ->General” and change the Site Title and Tagline. We are using Elementor Page Builder. Editing pages in Elementor is very easy. 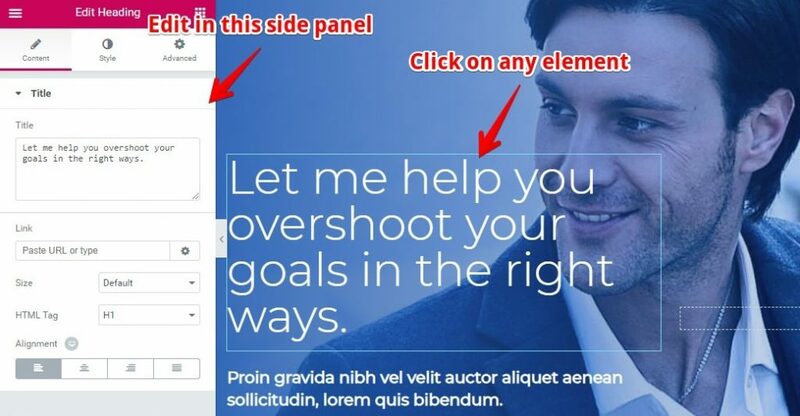 Elementor is free drag-drop page builder made it easy for you. In order to edit pages in Elementor, go to “Pages->All Pages” and select the page you want to edit. You will see visual appearance of page as well editing panel. You can edit all your pages or you can create you new pages as well. Elementor is very easy. Just try it.